Self-driving cars are a technological advancement we're slowly getting accustomed to seeing. Self-driving chairs on the other hand? Well, they're not quite as common but when they do make an appearance it seems to be the result of a Nissan experiment. Following its self-parking chairs, Nissan is showcasing its advancements in automated driving technology by releasing a line of self-driving chairs. 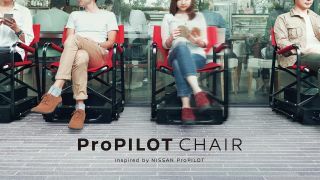 Named ProPILOT after the company's self-driving technology, the chairs have been designed to make waiting in long lines a more bearable experience. Instead of queues filled with unhappy standing people, slowly shuffling towards their goal, Nissan envisions queues where everyone is seated in ProPILOT chairs which automatically follow a preset path, using sensors to follow one another and maintain a safe distance. Unfortunately, unless you live in Japan, it's unlikely you'll get to take a seat in a ProPilot any time soon. Nissan has set up a demo unit in its headquarters in Yokohama and it's taking applications from restaurants across Japan interested in helping their queueing customers take a load off. Restaurants successful in their applications will be kitted out with the self-driving seats in 2017.